Date: 4.03.2018 | Dance, Disco, Pop | Tags: Italo Disco, New Generation, ZYX Music, Estimado, Digitalo, Jung Gang, Dj Rocca, Magic System Dj, Italove, Extended Version | Download ZYX Italo Disco New Generation Vol. 12 (2018) for free. The origin of the genres name is strongly tied to marketing efforts of the ZYX record label, which began licensing and marketing the music outside Italy. 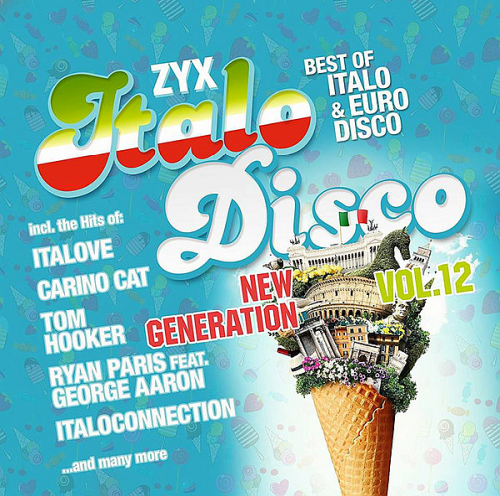 Meanwhile, ZYX Italo Disco New Generation has established itself as THE compilation with the current and modern produced Italo Disco tracks in the typical style of the 80s. Vol. 12 again offers a good mix of new artists and the heroes of the 80s. Italoconnection, Italove - Stockholm Is Calling, Ryan Paris feat. George Aaron - Can Delight. Italo disco evolved from the then-current dance music including hi-NRG and developed into a diverse genre. The genre employed drum machines, synthesizers, and occasionally vocoders and was usually sung in English, and to a lesser extent, in Spanish as well.